Goodyear’s G159 seems to be one of the most often targeted consumer products for major lawsuits. Indeed, the G159 has a failure rate higher than Takata’s airbags and has been named in more lawsuits as well. Allegations that the tire inexplicably loses its tread continue to mount as Goodyear claims suit-after-suit that RV owners failed to properly inflate the tires. One of the major problems with the G159 is that it wasn’t initially designed for RVs. The G159 was designed for urban stop-and-go delivery trucks and was then retrofitted for RVs as well. The major problem with that line of reasoning is that RVs are generally tasked with traveling along highways at high speeds while urban delivery vehicles tend to move in stop-and-go traffic. 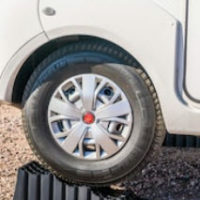 The other major problem is that Goodyear conducted tests on the G159 and their tests predicted that the tire could overheat during a long road trip. When the G159 overheats, the risk of losing its tread goes up exponentially. This created a perfect storm, a mounting number of lawsuits, and serious liability and ethics concerns for America’s top manufacturer of tires. Did Goodyear Black Hole Evidence Related to the G159? On June 19th of 2003, a Goodyear claims adjuster admitted something under oath during a deposition that Goodyear saw fit to settle the case immediately and then destroy all evidence that the deposition had ever taken place. According to the claims administrator’s testimony, Goodyear was aware that the tire was unfit for use on motorhomes. A judge in a later case ruled that the testimony was not protected by order and that plaintiffs could have access to the deposition. Despite a voluntary “customer bulletin” that indicated that Goodyear’s customers “preferred a tire that they can keep at lower air pressure” and an offer to replace the tires, the tires remained in heavy use for motorhome owners. In 2001, the NHTSA conducted a cursory investigation into the tires, but no recall was ever issued. Fast forward to 2018, and the NHTSA has initiated another inquiry into the tire after reports that it is responsible for the deaths or injuries of 95 people. If true, it would indicate that the tire’s failure rate is 10 to 27 times worse than the Firestone 500 series that the NHTSA declared defective in 1980 and resulted in a $500,000 fine to the company. Although reports of problems with tires are by now nearly two decades old, no recall has ever been issued. In addition, widespread concern over the tire’s safety is also a recent development. The investigation, which is ongoing, seeks to uncover what evidence Goodyear had of problems with the tire and when they had it. The NHTSA believes that the number of complaints can indicate a potential defect in the design of the tire. Tire companies have a duty to produce safe products. When a tire is defective, the company that manufactured it is liable for any injuries that result from the defect. If you’ve been injured, give the attorneys at Halpern, Santos & Pinkert, P.A. a call. We have successfully recovered millions in damages for our clients. We can help.